I can't skateboard - But I'm trying. Hard. I don’t have much time maintaining this website anymore because of career change. I spend all of my skateboard time on LDP and this website being mainly about “street skating” I don’t have much material anyway. This blog is not completly dead though, I might revive it next year after I move somewhere else but until then, it will be sleeping gently, entering hibernation. I have been looking for a new deck for my LDP (Long Distance Pumping) setup for a while. And while I was browsing the longboard deck section of amazon I saw this Flying Wheels deck on discount. Classic cruiser shape but way bigger. At first I was surprised, about 35€ (~40$) for a 96,5cm (42″) deck is really a cheap price. But as I didn’t want to spend a lot and I loved the kicktail look and the long wheelbase I bought it. Afterward I realized that Flying Wheels is a french brand from the East Coast of France and was pretty happy to be able to buy local. This deck is not listed on the Flying Wheels website but I think it comes from a former line of products. And that’s maybe why it was on discount. According to the Amazon page the wheelbase is supposed to be 823mm but I measured 77,5mm between the inside mounting holes so I think they just only didn’t measure it like they are supposed to. 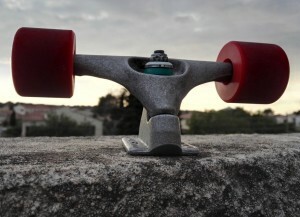 The shape is not really a LDP standard shape, these days most people use G-Bomb decks with forks or tail-less boards. But in fact, it is still close to one of the most famous LDP deck : the Walkabout, except it has a kicktail. As I explained on my About me page, my “first” skateboard since I really got into skateboarding was made from a sheet of thick plywood (with sandpaper glued with double-sided self-adhesive as griptape). But that’s not the one I’m going to talk about in this post. I’m going to talk about my first (and only, for the moment.) homemade skateboard deck made from maple veneer, which features concave and tails. 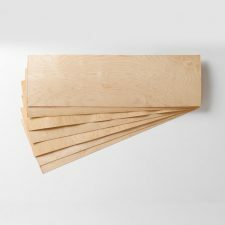 In order to build a skateboard deck, one need the adequate material : wood veneer. 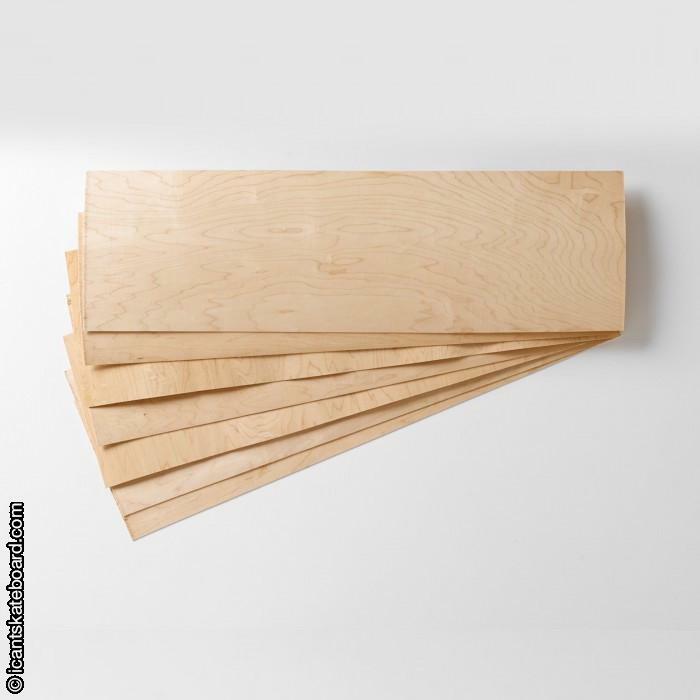 At first I tried to find local sourced veneer but I couldn’t find one that was at the same time thick enough, long enough and made from a good hardwood. I live in a part of the country where for some reason you can’t even find birch plywood, so finding some (good) veneer was an impossible mission. I even contacted the man behind Akasha boards, who lives not far from me, to know where he got his beech veneer. Unfortunately his supplier required a minimum order of thousands of Euros. So I ended buying my plies from roarockit.eu which allowed me to get correct sized veneer with cross grain sheets included, ready to be glued on. They were the cheapest veneer I could find online, and still made from Canadian hard maple wood. 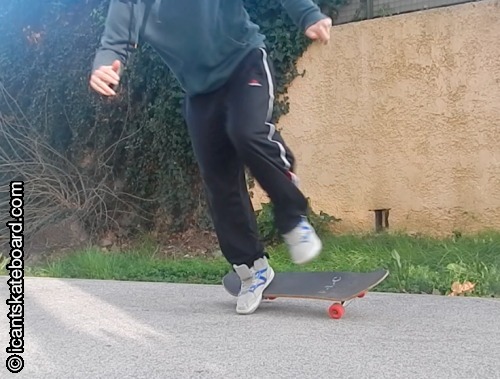 If you have read some other post on my blog you know that my main problem is that I can’t really ollie. I can kind of ollie, stationary, or over a very very small twig. Most people learn the ollie pretty quickly, or without major problem. I don’t, it has been a long struggle and it is definitely not finished. I watched millions of videos on Youtube, tried different trucks, wheels, decks, shoes. Practiced for hours on fake grass, on concrete, hanging to a gate. With different positions, the back foot either in the tail pocket or nearly hanging at the end of the skateboard. Same for the front foot. I tilted my balance in each and every directions. I tried to slide my front foot higher, lower, harder, softer, earlier, later. Yeah, I lifted the four wheels, but it’s not really an ollie. My front foot slide is done with the sole of my shoe and so my board doesn’t really level and my back foot keeps hovering it. My back wheels don’t lift high enough to land farther than where the front wheels lifted from (so not really a “jump” as I wouldn’t even be able to ollie over a line). It looks ugly and awkward and as my back foot is not in contact with the board, I don’t have much control and usually land with my feet in wrong places. Bearing Spacers: Why I’m using them and why you should too. The first time I used a spacer on one of my skateboards was after I received my pair of Surf Rodz TKP. 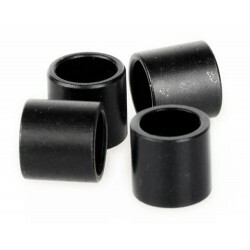 They provide four spacers as well as eight bearing with their set of trucks. I usually wouldn’t have used them but as there was no “speed rings” on the trucks I though they must have been designed to be used with spacers. As I felt that Surf Rodz know what they are doing I used them. And now I’m using spacers on each of my wheels, here is why. 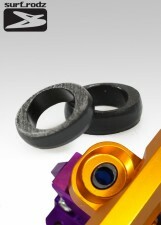 The spacers that are provided with Bones Swiss bearings are classy black but most spacers are only raw metal. Bearing spacers are simply little metal tubes that goes on the axles, between the two bearings. 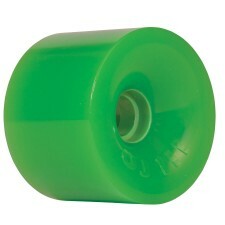 They exist in different sizes, but most are 8mm long on street wheels and 10mm long on longboard wheels. They have a very simple function: they prevent the bearing from being squeezed when the nut is tightened. If they are correctly sized, they allow the bearing to sit parallel one to another. Why is it nice ? The best thing about it, in my opinion is that it is way easier to install wheels on my trucks. With no spacer, I’ll have to put the wheel and tighten the nut until the wheels doesn’t have enough space to wiggle but not too tight or the bearing won’t roll anymore. Sometime a wheel won’t be tight enough and then it will slide from side to side as you roll, or sometime it will be too tight and the wheel will be slowed down… With bearing spacers I don’t have to think, I put the wheel, tighten the nut and then It’s down. The wheel doesn’t wiggle at all and the bearing is rolling freely. I spent days setting up this blog but for some good reasons. First I wanted to be independent and maintain control of my data, I had too many problems with services stopping and company closing. But I also wanted my blog to be SEO friendly and the fastest possible so I needed to have the most control possible on the software used to be able to tweak it like I want. So instead of renting a web hosting service or to pay for a hosted blog I decided to use a VPS (virtual private server) and do everything on my own. What are Surf Keeyz ? As for every fear, in order to overcome it you must find out what is actually scaring you. Obviously what scares us most when skateboarding is falling on the ground, and the pain that comes with it. But what makes you believe that you are going to fall ? Sometime we are not exactly scared about falling but scared about falling going fast because our brain is convinced that the faster you go the more painful the crash. At this moment I though I was going to die. It may be true in some case, if you step of your board at full speed you are probably going to fall harder that if you were static. Most of the time the scariest gap for a beginner is going from to performing a trick stationary to performing it rolling. That is perfectly understandable because as you are moving, physics are changing. Your balance will be challenged and the trucks are not going to respond the same way. As I explained in my Carver CX Review, something I didn’t like was the kingpin sticking out and hitting coping or curbs. I had a great email exchange with Neil Carver (who designed the truck) about it. He told me “Flipping the kingpin is a very good solution” but he also warned me that “It’s dangerous and you could break the base if something goes wrong. How’s that for fair warning? “. Nonetheless I decided not only to flip my kingpin but also to change it for a DIY metric hex button head one. It is made of metric Class 10.9 steel which is a bit stronger that Grade 8 steel. It is also a little bigger in diameter so the base will need to be redrilled and going back to imperial kingpin will be difficult or even impossible. Big, soft and fast ! Neon green is the new black. When I began LDP (Long Distance Pumping) I only had wheels that were too hard or too small to go fast and smoothly. As I was searching for new wheels I stumbled upon a sale on Amazon, a set of OJ Wheels Thunder Juice 75mm 78A for about 18€, the full price was 65€. As I had read on PavedWave that I would need big and soft wheels, I though it was the right choice. So I bought it. The Thunder Juice are really huge compared to classic street wheels, both in diameter and in width, but also a way lot heavier. They are the fastest wheels I never tried. Pushing will be just a little harder as they have a huge momentum but you will go fast and far. When you swap small wheels for these beasts it’s like your board never really wants to stop. © 2018 icantskateboard.com - All Rights Reserved.